Battery technology is one of the stumbling blocks on the way to introduction of more efficient electric cars and trucks, not to talk about storage of home-produced electricity from sun, wind or other intermittent renewable sources. While there are new kinds of batteries being developed (see the Battery Directory on PES Wiki), no cheap and easy solutions have entered the mainstream yet. 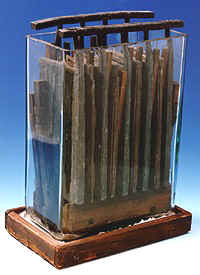 Most cars are still using the type of battery developed by Frenchman Raymond Gaston Plante' about one-and-a-half centuries ago. There seems to be a way to convert an old, almost exhausted lead-acid battery into a functioning alkaline battery that is not widely known. The information was posted to the watercar yahoo group and through an unlikely chain of forwards reached me by email. Since this information is not widely known, I would like to make it available here. If you decide to experiment with this, know that you alone are responsible for what you are doing. Don't do it unless you are technically savvy. Should you find it works and want to share your results, you can always comment at the end of this article, and if you feel like thanking the guy who put the information together, you can email him at tshell - at - mcdranch - dot - com. Here is a free gift to all of you and all the world. Read carefully and follow up on all the links and you'll know as much as I do. Then go fool around with the stuff and see what happens. As a favor, please let me know what you discover. As far as the lead acid batteries go, they can be a pain. But I am researching the possibility of converting lead acid batteries to alkaline batteries. I had a semi-genius friend once give me this information but have yet to see it anywhere else in public domain. My friend claimed that you could take a weak lead acid battery, one that was still able to be charged but whose lifecycle was nearly finished and convert it to an alkaline battery by dumping out the battery fluid and replacing it with a mix of water and alum. Alum is sold in the super market spice section for making homemade pickles, it makes them crisp. It is sooooooooo cheap. And soooooooo safe, you can eat this stuff, okay? I don't recommend eating it because of the aluminum connection to Alzheimer's disease. I experimented with old batteries and had two successes and two failures. The successes were total successes and the failures total failures. I used 4oz of alum to 1/2gal of water. You just replace the fluid, recharge the battery and off you go. The successful batteries seemed to be more powerful than the original, however I have no data. The best one was destroyed in a vehicle fire. It has been over 10 years since I did those experiments and I am getting ready to try again. The advantages of the alum battery are many. I will be trying this experiment with some better measuring tools. I want to go to a battery shop and try this on numerous old junk batteries. My feeling is at this point, if the battery is too dead to take any charge at all, it is too far gone to recover with this method. This process has never been commercialized that I know of except by one company in China. From what I can read, I think that their battery is pretty much the same as this homemade solution, but all worked out scientifically. It is extremely simple. I'd love to have some assistance from more knowledgeable folks on how and why it works to be able to perfect it. When you realize how cheap this is to do, you'll really be doing some head scratching. You can have a renewed battery for the price of a few bottles of alum. Another related bit of information is this. There was a company set up in China called Guineng who was manufacturing and selling a new type of battery. They indicated on their web site that it was a silicate salt battery. I'm pretty convinced it was of this type I am experimenting with. Well, they had a good site with lots of info. But there has been no success on my part in contacting them in any way. I've tried like the dickens to get ahold of this company but have never had an email response, cannot get through by phone, just impossible so far. They were reported to be selling their battery to E-Max scooters in Germany. The bikes are being sold down under and the first reports on performance are coming in. But here it is, take it and see what you can do with it. I am going to try to be working out the correct ratio of alum to water myself in the future for my new used battery bank. The proven, tough and rugged New e-Max with its 8 x 12V/20A Silicon battery system is unique in e-scooters. Silicone Battery Comparison. No more old style lead acid batteries to bog down performance and create havoc in the environment with its destructive pollutants during production, use and disposal. The new GUINENG Silicone power batteries in the e-Max break away from the old and embrace a breakthrough in an enviro-friendly tough and rugged package. An extremely long-life energy supply specifically designed for the e-Max, the new Silicone system offers a never-before seen performance standard... shelf life and power! You can store the batteries, unused for up to 1 1/2 years with voltage going down less than 1 volt! No memory loss! Constantly worrying about losing battery memory and battery damage is no longer wishful thinking! And power! Jianmen Yu Yang Special Storage Battery Co. This is a Chinese company who has developed a Silicon based battery chemistry that shows great promise. Completely breaking away from the technological limit of lead-acid batteries,GUINENG silicone power batteries embrace a breakthrough, where silicate salt is used as electrolyte. GUINENG batteries have enormous and durable power and are pollution free. GUINENG has a universally recognized edge over commonly used lead-acid batteries nowadays in the world, due to its high capacity, high current output, rapid recharge time, low temperature performance, long life span, and environment-friendliness. 	High current discharge. The battery will not be damaged when discharging within 8 seconds at the temperature of 30°C. Deep discharge is allowed. 	Low self-discharge. After fully charged, the battery can be used within one year at a normal temperature. 	Sealed with a release valve. Maintenance free. 	No acid mist emission when charging or discharging. No pollution from the electrolyte. 	Long life span. Under normal circumstances, the cycling life is as long as 10 years for the GYM Series. 	Over 400 times of recharging. No battery has outlasted the Nickel Iron battery in daily use for Home Power Systems. This environmentally friendly battery has been in use for over 100 years. In many cases we have documentation that there are batteries still is use and still producing 100% of their battery capacity after 60 years in service. Are these batteries available for automobiles? If so, what does one cost? Great idea, hope it will work out. 1. Use personal protection and safety precautions when removing the battery electrolyte. 2. Due to its lead content it is industrial waste (poison) and must not be poured down the drain or into nature. REASON: what gasses out of the battery when charging is not the alum but as usual the elements water is made of, oxygen and hydrogen, an explosive combination. LIKELY UNTRUE: The claim that the silicon battery is less environmentally harmful is only true if it is NOT using lead, so it is a technology different from the topic of this posting. This is a great discovery, but the idea of "dumping" the contents of the old battery really creeped me out. It is very poisonous, dangerous toxic waste. That liter or so of liquid in a lead-acid battery is sulfuric acid that can burn your skin and blind you if splashed, with a huge amount of dissolved lead, so it must be taken to a hazardous waste company for disposal. SEPP ET. AL.--- THERE ARE A FEW ADS ON THE WEB FOR RECYCLING BATTERIES COMMERCIALLY-- MAINLY THE RECHARGEABLE PORTABLE TOOL TYPE. SMALL CHARGE FOR THE INFO. AS I USE 6V. LEAD ACID BATTERIES IN MY BUSINESS, FOR ELECTROPLATING THEY GO BAD RATHER QUICKLY, ABOUT ONCE A YEAR SO I WILL HAVE GOOD REASON TO TAKE A LOOK AT THE SUGGESTIONS HERE AND GIVE YOU A REPORT. ALKALI MIX IS NOT 4 OZ ALUM TO 64 OZ- DISTILLED WATER. IT IS 4 OZ OF ALUM TO 40 OZ-DISTILLED WATER. SUGGEST THEY TEST THIS TO SEE IF IT WORKS BETTER. I used to rebuild automotive batteries for a living. Back then, you just heated up the tar seal and pulled the cells. I can tell you that most battery failures are due to vibration, where the plate or a cell connection breaks. Life expectancy is mostly affected by high current draws that actually flex the plates. This leads to loosening of the powdered lead on the plates. The powder builds up in the bottom of the battery and eventually reaches the level of the bottom of the plates. At that point, the cell plates short and it's finished. After plastic batteries were introduced, we couldn't take them apart anymore. So we simply invert the battery and drained the acid into a Poly plastic container. The acid won't eat poly or styrofoam. Use poly gloves, not latex. A lot of the crud comes out with the acid. Fill the cells with water, agitate and invert into another plastic container. A small trash can works well. Repeat this process until the battery rinses clean. Wait a few days. The heavy lead products in the acid and the rinse water will settle to the bottom fairly quickly. The container with rinse water you can neutralize with baking soda. An electrolytic process can probably remove the remaining dissolved lead products, but most of it settles. Pour off the clear liquid until the crud is left at the bottom. Leave it in a plastic bucket until it dries. Or, if you do this regularly, save this rinse water for other batteries. Filter the acid and reuse in the battery. You will need to top off the cells with more. Pour the leftover crud into the drying bucket. About 50% of batteries will get a useful life again. As far as replacing the sulfuric acid with Alum, I would be concerned about the aluminum precipitating out of solution and causing shorts. But the biggest problem with lead/acid batteries is the lead, not the acid. I think I'll try it though. since i didn't want to waste a good battery i started this experiment by using my oldest junk battery.it was literally covered in the weeds, had been open for years and was half empty. i topped it off with distilled water and charged it up. but when i tested it @100amps it showed as three cells dead. i looked inside it and saw that three of the cells were caked up in that white crystaline SULPHATION that shorts out the cells. i knew there was no chance that it would work in that condition so i resolved to clean it up first. i did this by making a gallon of solution of distilled water with as much baking soda as it would dissolve mixed into it. i dumped out the battery and filled it with this solution. WARNING: wear EYE protection and old clothes and shoes. even a small drop of battery acid will eat a hole in them. WARNING: fill slowly because the chemical reaction is violent and will boil over and shoot out if done too fast. i noticed that when full it continued to bubble about like it does when charging. i let it set overnight until the was no sign of chemical reaction. upon inspection i was pleased to find the battery plates AS CLEAN AS NEW. no sign of the white crystaline SULPHATION. i dumped this solution out and replaced it with distilled water. i reasoned that this would absorb any residual baking soda. i let it stand overnight. i dumped it out and filled with the ALUM electrolyte solution of 1oz. ALUM per 10oz. 's distilled water. and hooked up the charger. at first it didn't want to take any charge. after i BUMPED it a few times by hitting the quick charge switch on the charger ( i figured it needed to be RE-POLARIZED) it started to take a charge. but only around 5 amps. over a few hours this increased to 15amps. when the charger showed the battery was full i tested it with a 100 AMP LOAD TESTER type meter. it showed as marginal weak. i knew this battery had previously shown three cells dead. it still showed three cells dead but also showed the other three as GOOD. this indicated to me that the principle was valid so i decided to repeat the experiment with a good battery. i followed the same procedure wityh a DIEHARD group 65 700cca battery that was several years old but still tested as good after one test @100 amps but marginal weak after two tests. after filling with the alkaline i tested it and it immediately checked as OK but on the low side. i charged it 4 hours @15 amps.it tested as high as a new battery. even after four tests @100 amps it still showed as good. CONCLUSION: usually when somethings too good to be true it ain't. but this is contrary. THIS WORKS! I want to try this, but need the formula clarified, as we're putting a powder into a liquid. Is it 10 Fluid OZ (volume) to 40 Fluid OZ (volume) or 10 OZ (weight) to 40 Fluid OZ (volume)? With regard to waist Sulphuric Acid, it's not the acid itself, it's the disolved Lead that's the problem. Has any one tried to do this on Sealed Lead Acid Batteries?. It's probably a bit of a job making sure the electrolyte has been fully replaced. Hi friends: I am very glad to find so many people working on saving batteries! I have been thinking about using baking sosa to clean the batt. as I have used it with lemon juice to clean silver and other metals with sulfate and it works great. I may use the Alum and water on four deep cycle Trojan batteries I use on my 12 panels solar system and I hope it works. Thanks! Thanks for the info! Any new news as how the Alum/water conversion is working so far on the batteries that have been converted to alkaline? 1) Removed and stored the acid. 2)Cleaned the battery with baking soda/water solution. 3) Washed with water three times. 4) Washed with destiled water. 5) Filled with Alum 10z to 10oz water. Charged the battery to 100% but battery lost the charge rapidly as before. It seems that is the battery is good the Alum will work just fine. If the battery is bad, the Alum is not going to help to bring it to life. One of the batteries I filled back with acid instead and the behavior was the same as with the Alum. I read that you can open the battery and clean it. I did this carefully but the plates will brake easily. I believe it will be very hard to pull the complete plate group as one without damage to them and for me is not worth the effort! PS I may try the alum on a better battery. I did tried also on sealed batteries by removing the top plate. I found the have caps just like regular batteries but they are covered with a plastic plate that can be removed with easy. I had the same result as with the deep cycle batteries. Fast charge but rapid lost of voltage. Well time for an update, it's been a while since I posted the original info as there's been more discovery. As far as the Guineng batteries go, that company was infringing on the patent of the original company and is out of business. The real company is Greensaver. There are companies in the US selling the Greensaver batteries. I was able to buy one and have it in a vehicle. The battery seems to have plenty of power. 1. The ratio I have always used is 4oz of dry alum powder to 64 oz of water. I have recently converted a battery with 50g alum to 1liter of water. That is very close to the same ratio. Some have posted using very high ratio's. They may work, I don't know. The water will only absorb a certian amount of alum and then reach saturation. Saturation is 68 to 79mg/l at 20*C, ph - 9. It is not necessary to use so much alum. Save your money. If the battery will not take or hold a weak charge, then it may not be able to convert. The conversion process uses the sulfation of the plates as a catalyst in the chemical reation. So it is not necessary to do any washing or rinsing with baking soda solution. The sulfation of the plates begins reversing when you add the alum solution and it will end up being removed over time. Chosing a very old and malfunctioning battery for the conversion may not yeild a useful battery after conversion. There is enough evidence from my work and that of others posting that the concept is valid and works well on appropriate candidates for conversion. What remains is to more scientifically calculate the ratio of alum to water for the project. I am convinced from what I am seeing that the Greensaver battery can be essentially homemade by the alum conversion technique. By the way, I have started a new Yahoo Tech Group to discuss battery conversions. I GOOFED GUYS! i just learned i made a TYPO. it's 10 oz. alum per 100 oz. distilled water or 1 oz. per 10 oz. i am SORRY! also i used USP grade ALUM. "OOOOPS I GOOFED SORRY! i made a typo in my posting. a BIG MISTAKE! i meant 10 oz. alum for 100"
Does anyone of you here had an ‘old’ laptop whose batteries can’t even last 10 minutes? Well, instead of playing with it by tossing it into an open flame to see what happens or throwing it in the dumpster where it’s ecologically not helpful, why don’t you try reviving it? Yes you can! With some newspapers and a fridge of course. According to the ‘expert’ you need to take those old batteries out of the casing, wrap it in newspapers (thick enough so not much moisture will be in contact with the batteries) and leave it for like a week or so. Let it cool down in room temperature after that for at least a couple of hours or a day. Once it has settled down in room temperature, wipe off any traces of moisture on the batteries, put the batteries back in its casing, stuff it back in the laptop and charge. (Do not switch the laptop on!) Make sure it is 100% powered up. I saw this battery mod just after my first spring attempted use of my garden tractor. The battery had been charged over the winter a few times, as I run my equipment instead of winterizing. Well, it would not turn the engine over. It showed 4.5 volts and would charge to 14 volts, but would not even run a light for a few minutes. Conclusion, Looks like it worked pretty good. I have read of the mix being 1:10 to 1:64, mine was 1:32. Think I'll try a stronger mix, the 1:10 next time or maybe stauration. Neat experiment and test. I will try that on two Trojan 6 volts I have. In what store did you buy your Alum? I took a ten year old battery. Cleaned it out and filled the cells with 1:10 alum / distilled h2o. I could not revive the completely dead battery but I could get it to hold a charge of 2.84 volts. I am guessing cells were too far gone. May try it with a new battery I just purchased for our mower. Will update later. I too have tried the experiment during this week. I used a battery that after a full charge could start a car 24 hours later. Replaced the battery with a new one but kept the old one to experiment with. 6. Put the battery on charge and struck a snag. Battery seemed to charge rapidly but not to reach full charge. My battery charger is a small unit with only 3 settings, trickle, heavy or starting. 7. Connected a digital volt meter and switched from trickle to heavy. The charger seems to cycle between 13,5V ~ 14.2V and indicates an intermittent “battery full” LED, i.e. the LED flickers on and off. In desperation switched to start. The volt meter went steady @ 14.2V, the built amp showed 5 Amps and the battery full LED glowed full on. 9. Will put a load on it tomorrow to see if there is any success. Sorry for posting my message twice. I goofed on the posting anyway; I left out a "not"
I have done this process and had success. My son's quadbike has a 12V lead acid battery that is only about 6 months old. The ignition was left on for about 24 hours once and the battery was dead. I recharged the battery and it lasted for about 2 months, after which it would not take and hold charge enough to start the bike. I took the battery and emptied out the fluid that was in there. I rinsed it 3 times with boiling water. Then I poured a saturated solution of Bicarbonate soda into it and let it stand overnight until no bubbles were coming out. I emptied that out and rinsed it once with distilled water and emptied that out. Then I put in a Alum:distilled water solution of 1:10 and charged it overnight. Before I started this whole process it showed 9,3V and after charging it with the Alum solution, it showed 13,5V. I then put the battery back into the bike and it cranked strongly and the bike started easily. I started the bike for a few times and the battery remained strong. I will now see how long it lasts. I am now ready to try and revive a old truck battery that is standing on the farm for a few years. Hi all: well good news. A battery I had filled with the 1/10 Alum solution and had let stand for months outside is now getting full charge! I decided to try charging it again with my solar system and this Trojan 6 volts battery is holding the charge and charged to 6.15 volts today. It may take a while to charge it to full as it is a 220 amps hour. huh did you not read what i posted raymond? sepp says its silicate its not!! so whats your point? alum is cheaper than battery acid? battery acid is H2SO4 a SULPHATE!! so it makes battery acid? I dont see any magic here! I am not trying to prove anything, just sharing the tests. That old 6 volts 220 mHa Trojan was not holding charge when it had the reg. acid. With the Alum it charged and now holds the charge to 6.30 volts and I have been using it in my Solar system for a week now! There are so many “ALUMS” Out there it makes the mind boggle. The “ALUM” that we are looking for is known by many names i.e. Silicic acid or Aluminium sodium salt or Sodium Aluminosilicate or Aluminosilicic acid or Sodium salt or Sodium Aluminium Silicate or Aluminum Sodium Silicate or Sodium Silico Aluminate. Whatever the name one thing is true - the chemical formula is Al Na12 SiO5. The formula for Potassium Alum is KAlSi3O8. “Alums are useful for a range of industrial processes. They are soluble in water; have an astringent, acid, and sweetish taste; react acid to litmus; and crystallize in regular octahedra. When heated they liquefy; and if the heating is continued, the water of crystallization is driven off, the salt froths and swells, and at last an amorphous powder remains. In South Africa one can only source Aluminum Sodium Silicate from specialised Chemical Distributors. I discovered my ALUM at a chemist. HOORAY!! The chemist promised to get me the chemical formula, and, to my dismay I discovered that the Alum that I used, like many of us have, is different – it is Aluminium Potassium Silicate and this is definitely not the “alkaline” alum; I however did get some startling results. The converted battery was put on load using a 65W quartz halogen searchlight. After 2 hour, voltage dropped from 11,6V down to 10,2V when it was switched off. Overnight it went back up to 11.4V. Switched on for 2 hours at which point it went down to 9V. The cycle was repeated again in each consecutive night until the battery was down to a mere 4V. At this point it recovered to 8V and drew down rapidly afterwards. Battery was recharged and on applying load it was definitely stronger. This time I discharged it down to 4V in a single 6hr session. The cycle was repeated 4 times, the battery seemingly gaining strength, when the battery reached 12.5V, fully charged, after a charging session using a pulse charger. What amazes me is the charging rate; in less than 1 hour it showed 11.5V with the additional 1V to fully charged taking another hour. On tasting the electrolyte, no I am not stupid; I did not find it acidic at all. Both Potassium and Sodium alums are used in food preservation and cooking according to my chemist. I tried it in my car and after 2 weeks it has dropped down to 12.4V where it seems to have stabilised but it still cranks better the new replacement. I still have not managed to trace the correct alum. I was warned by my brother that I could damage my alternator due to the lower voltages of the “ALUM” battery. When the charge rate was checked with all electrical devices on, it was in fact lower than with the normal lead acid battery. The alternator could overcharge as the battery is effectively the voltage regulator and the alternator is set to cut out or cut in at a certain voltage. The danger of a runway overcharging alternator was deemed insignificant after thourough testing; in fact, in my experience, it will work less due to the rapid charge characteristics of the alum battery. BUT BE WARNED – OVERCHARGING CAN TAKE PLACE. Should you wish to use a converted battery on your daily rider, I suggest that you have the charge rate checked to prevent a costly alternator rebuild. Did some research and found that E554 is the same as Sodium silicoaluminate ,AlNa12SiO5. Microcline or Potassium aluminium silicate , KAlSi3O8. on food labels throughout the European Union. PS On checking my batteries in the solar batt bank. The highest charge was the 6 volts 220 ah Trojan converted with Alum at 7 volts the others were 5.6 and 6 volts. Could anyone provide a list of sources and prices for Alum please? I was able to find some on ebay at $10.00. Im very interested in converting brand new batteries that havent had the sulphuric acid poured into them yet. You can buy these GC2 deep cycle 6v batteries dry and then they put the liquid in. My question is to Carlos and others, How are the batteries you converted holding up? had the sulphuric acid poured into them yet. then they put the liquid in. How are the converted batteries you converted holding up? I am very interested in all of the above discussion. I am sick of constantly buying new batteries for my farm vehicles every 3 years and have accumulated about a dozen that still charge up ok but go flat after about 2 weeks of non use. My problem is that I don't know where to get hold of the Aluminium Sodium Silicate. The Alum everybody has talked about getting in the pickling section of the supermarket is really Aluminium Potassium SULPHATE. The stuff we need is used as an anti-caking agent in table salt and is coded E554. Chemists seem to be a good source, but for the quantities I need they would be a bit expensive. Another problem I have is resolving the problem of solubility in water. According to info in the Silcates pdf link the AlNaS we need has a solubility of 48mg/lt at 20c and 6660mg/lt at 30c. this is nowhere near the 1 to 64 or 1 to 100 ratio recommended. So I think a lot of you guys are using the wrong stuff. Has anyone thought of using Sodium Silicate (water glass)? This stuff is very soluble, cheap and easily available. I have talked to a chemist here in NZ but he studied a long time ago. It may be possible to drain the acid then put in Aluminium foil then baking soda, wait for the fun to finish then put it back without the bits of lead. I haven't tried it? what do others think? If you get 12 50 gallo platic drums o (one anode one cathode) , put them in series and you would have a HUGE 12 volt battery with undown but probably enprmuuos AH capacity. I would like to try it (Iv'e got 10 acres in the woods. Has anyone done it or intersted in following through? The converted battery is going strong but I removed it from the car, a Citroen C5, for fear of cooking the electrics with the wrong voltage/s. The C5 uses multiplexing and very small variations can cause problems like a “resetting” whilst on the move. I have not given up yet. I am now trying to find Sodium silico aluminate to E554 specification and purity with not much luck. What I have discovered is that the initial concentration of the electrolyte that I used is much too high. I have since duplicated the test on another faulty battery changing the solution using Potassium aluminium silicate E555 to 1 part alum and 150 parts distilled water with precisely the same results as a far stronger result. I am going to dilute the electrolyte further and re-test. The original battery is now being used as the backup for an electric gate. In south Africa we suffer from regular and lengthy electricity blackouts, called “LOAD SHEDDING” in the local parlance so a strong battery is required. The little, piddly standard battery was good (when new) for approximately 8 open / close cycles. The converted battery just goes on forever. I have also repeated the charge / discharge tests on the latest battery with similar results. I have now blown 2 x 100W halogen (headlight) globes; I use the globes as “load” for my tests. I have drained the battery to zero on several occasions and still it takes a charge and performs. Once I get hold of E554 I am going to repeat the test on the cheapest new dry battery I can find. This research shows a lot of potential. So tonight I'm actually going to try the MGSulphate first. It says nothing about neutralising the sulphate buildup with Baking Soda. Since reading the advice here I've already done this on a previously dead battery overnight. So we'll see what results will come of it.